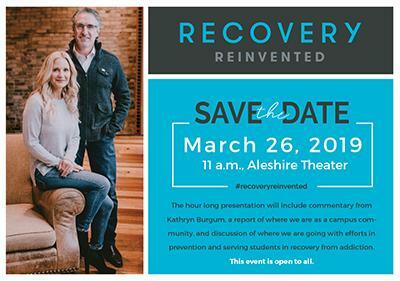 MINOT, N.D. – North Dakota first lady Kathryn Burgum will be at the Minot State campus on Tuesday, March 26 for a Recovery Reinvented panel discussion about drug addiction and recovery affecting university students in Aleshire Theater at 11 a.m. The panel will be made up by Burgum; Vicki Michels, Minot State chairperson for the department of addiction studies, psychology, and social work director of addiction studies; and Minot State University students Molly Allery, Brittney Eisenzimmer, and Michael Chappo. Topics will include commentary from Burgum, a report on substance use on campus, and a discussion of how the state and campus can better serve students in recovery. This idea of harm reduction will be just a part of Tuesday’s discussion, which is open to all Minot State students. Recovery Reinvented, a creation of North Dakota’s first lady, focuses on eliminating the shame and stigma of addiction and finding solutions to help people affected by the disease of addiction with prevention, treatment, and recovery approaches. The event compliments a recovery group recently launched on campus that meets Fridays at noon in Memorial Hall room 230A. Having a public figure honest about past struggles is an important part of destigmatizing addiction and substance abuse.